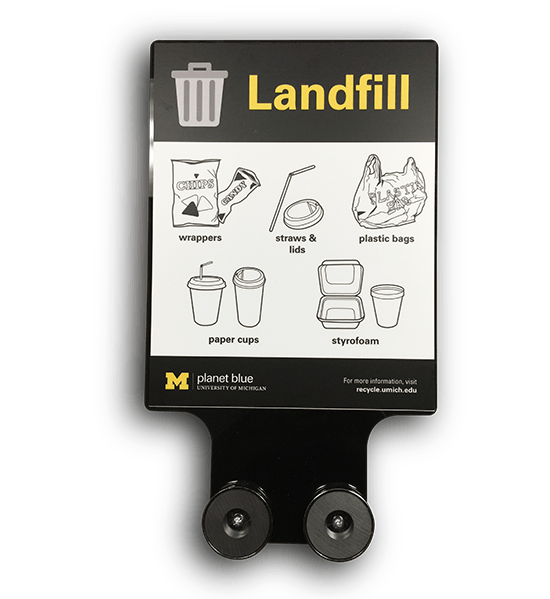 Magnetic sign holder for University of Michigan recycling. The University of Michigan instituted a campus-wide recycling awareness program in 2016. As you might imagine, 70,500 students, faculty and staff generate a lot of garbage. The Planet Blue team needed a durable and reasonably priced solution to get the good word out and encourage people to put their trash in the bins for recycling. We teamed up with an excellent local printing/graphics company to provide a turnkey solution. The printing/graphics company provided artwork and durable labels. We provided custom sign substrates assembled to powerful magnets that were mounted to steel recycling bins. In the four months of the 2017 winter semester alone, 1,178 tons of waste were recycled with this program. We call that a good start.